Tiny Phillips are an alternative electro, grime-guitar infused band from Manchester, whose textured soundscape and provocative lyrics makes them a contemporary and ultra dynamic band. With Pete O’Connell on vocals , Ric Ashworth on guitar, Nick R on guitar, Sky Halfpenny on synths/keyboards, Dan Phillips on bass and Sam Kearney on drums, Tiny Phillips benchmark the modern Indie band and pushes boundaries with their individualistic brand of music. Whilst electro-guitar bands are very much on the radar around Manchester, what’s interesting about Tiny Phillips is their slight infusion of grime rap, that gives them a varied appeal and makes them stand out from the crowd. Having toured with “Peter Hook and the Light”, on their Unknown Pleasures tour in 2012, “Tiny Phillips” are quickly developing a solid fan base, including Hooky himself who said in a recent interview: “With regards to other bands, I am really into two young Manchester bands that we are taking out on tour with us in November to support us on the UK tour Shinies and Tiny Phillips. They are both great bands and through them it sounds to me like the future of Manchester music is in good hands.” As a frontman, Peter O’Connell ticks all the boxes, oozing a cool confidence and passion that is prevalent in his live performances. Sounding a cross between Marc Almond and Mike Skinner, O’Connell represents that new breed of frontman, reminiscent of the New Romantic Period, that are neither dandy or flamboyant, but convey an understated showmanship that stands it’s ground against the genre-bending soundscape. Lyrically “Tiny Phillips” songs are an interesting mix of romantic sentiments and urban grit, which don’t overload with narrative dialogue. 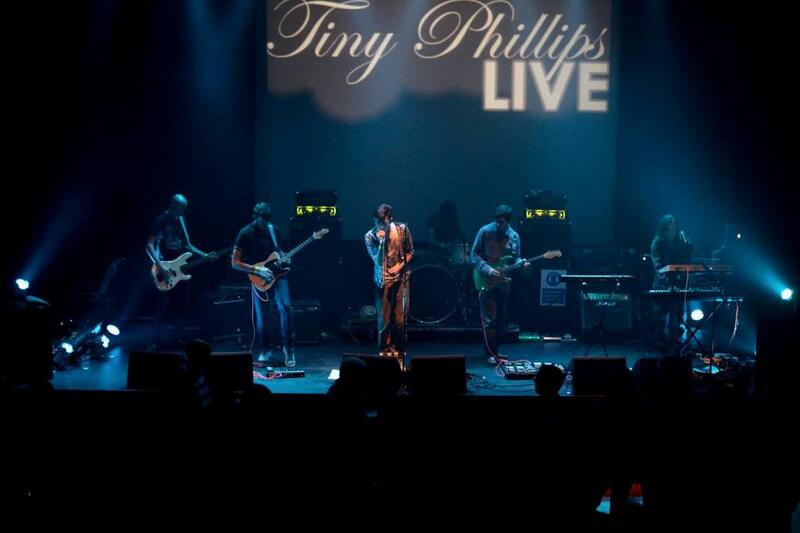 With a new EP, set to be released in March 2013, Tiny Phillips are definitely a band to look out for and whose single “Lumière” sets the bar high for any future songs. Having spent over four weeks at no.1 in the unsigned indie charts with their single “Queen Of Your City”, Tiny Phillips are quickly gaining more popularity and now with their follow up single “Lumière” released in February 2013,Tiny Phillips are proving that they have their finger on the pulse in terms of progressive indie music. As a stand alone single,”Lumière”, is testament to the fact that electronica music can stretch its wings and with the right frontman can incorporate a more urban sound. Kick-starting with its chilled, loose drums, “Lumière” soon breaks into a lush Owl-City-esque whirl of synths that weave and shimmer around the jangly riffs and wavering bass, making a grand entrance. It’s a fresh, contemporary song, highlighting O’Connell’s skill at vocal/rap delivery with the lyric: “Not another scally tryna get you in his ride”…” Along with the trembling, Horror-esque backdrop of synths, “Lumière” becomes erratically charged through the glistening wave of chimimg and Air-esque space-pop synths. Synchronising with the lyrics such as ,“My light is shining bright for you… ”, it’s the trail of luminous and blackened horn synths that, despite their irregularity, thrive collectively to create a euphoric and cohesive sound. You can catch Tiny Phillips in Manchester on 1st March 2013, headlining at “Dry Live” on Oldham St, Manchester.